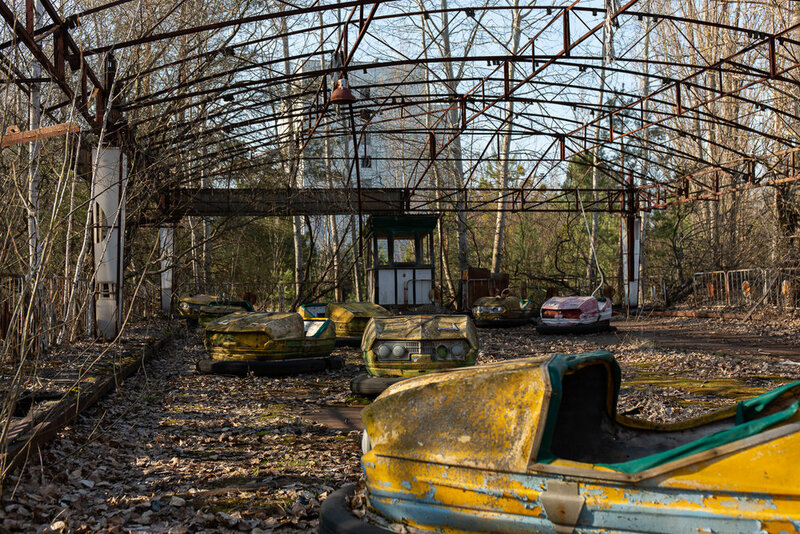 The amusement park in Pripyat has to be one of the iconic locations within the city. It was just being set up, ready to open for the May Day celebrations in the city on 1st May. However, the nuclear disaster on the night of the 26th April 1986 meant that Pripyat was empty and abandoned by the end of April. Many Russian cities had amusement parks known as a “Park of Culture and Rest” and some of these are still working around both Russia and the new countries formed after the break-up of the USSR. 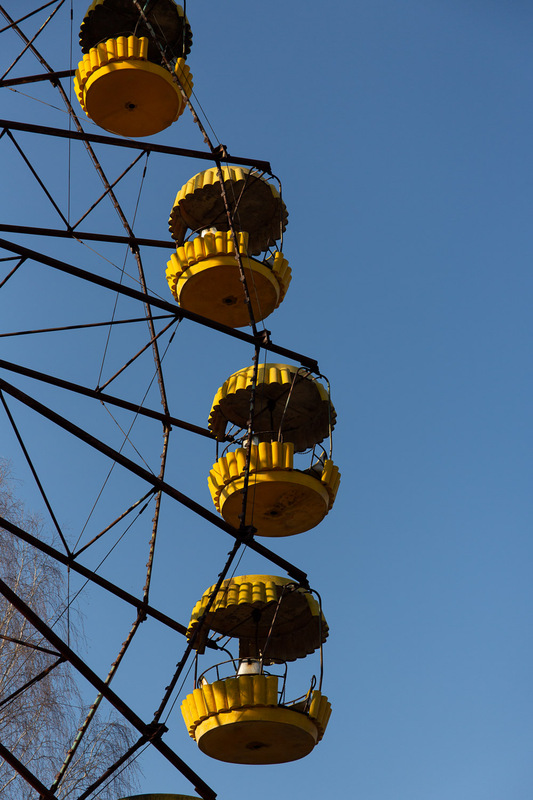 The Pripyat Amusement Park had a 26m Ferris wheel, swing boats, a paratrooper ride, bumper cars and a shooting game. The fairground was opened briefly when it was decided that a distraction was required on the morning of the 27th April, just before the notice to evacuate was given. An incomprehensible action today given what we know now about the severity of the disaster and the levels of radiation already in the area that morning. It wasn’t really ready, the Ferris wheel was still behind cladding and the paratrooper ride did not have the canopies in place, but people were excited and visited the new park. The park sits empty and lonely. The bumper cars are where they were left, leaves blowing around the barriers. The seats on the paratrooper ride are slowly rusting away and the Ferris wheel is fixed and fading. The yellow capsules remain as bright as they originally were in places but the supports are orange with rust and the paint is flaking and peeling. Radiation levels around the park vary; the liquidators washed radiation into the soil after the helicopters carrying radioactive materials used the grounds as a landing strip. Concreted areas are relatively safe, but areas where moss has built up are high. Some areas can emit 25 µSv/h and one particular hot-spot on the underside of a ferris wheel capsule was found to emit just under 230µSv/h. These are some of the highest levels of radiation in the whole of Pripyat. The park appears in the video games S.T.A.L.K.E.R. : Shadow of Chernobyl, Call of Duty; Modern Warfare, in the film Chernobyl Diaries and is also the inspiration for Atlantic Island Park in The Secret World. It is lonely and desolate, a jarring place of normality and disaster fighting with the senses.